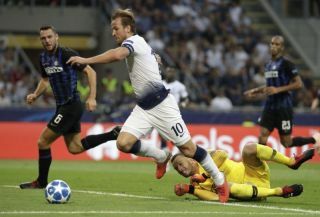 Harry Kane’s struggles continued on Tuesday night in the first half of Tottenham’s clash with Inter at the San Siro in their Champions League opener. As noted by Sky Sports, the 25-year-old insisted prior to the game that he had no concerns over his fitness despite his lack of goals in recent outings. In his defence, as seen in the video below, his first touch was perfect to create the space to take on Inter goalkeeper Samir Handanovic, but unfortunately for the England international, he fluffed his lines from that point onwards as he tried to take it round him before seeing the ball trickle out for a goal-kick. There is a genuine argument to suggest that a fully-fit Kane buries a chance like this, but whether it is a fitness problem or a lack of confidence, he certainly doesn’t look as sharp as we’ve come to expect given his prolific goalscoring record in recent seasons. As seen in the tweets below, several Spurs fans made the same point about their talisman, with many calling on Mauricio Pochettino to rest him. So anyone saying Kane is fine, watch the replay. Clearly not fine! Expect that from Llorente not Kane, wow. Kane 6 months ago dinks that and we go 1 up!! Coys ?? ?